Born in the village of Knowle in Warwickshire, England. After leaving school, Wyndham tried several careers including farming, law, commercial art and advertising, but mostly relied on an allowance from his family. He eventually turned to writing for money in 1925, and by 1931 was selling short stories and serial fiction to American science fiction pulp magazines, most under the pen names of 'John Beynon' or 'John Beynon Harris'. After WWII Wyndham returned to writing. Using the John Wyndham pen name for the first time, he wrote the novel The Day of the Triffids. The book proved to be an enormous success and established Wyndham as an important exponent of science fiction. He went on to write and publish six more novels. John Wyndham's book The Chrysalids was available from LibraryThing Early Reviewers. 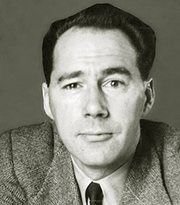 John Wyndham is currently considered a "single author." If one or more works are by a distinct, homonymous authors, go ahead and split the author. John Wyndham is composed of 26 names. You can examine and separate out names.